One solution of modern heating is the wall-heating panel. The panel is placed inside the wall so it does not upset the aesthetics of the room. The panel can be applied both in heating and cooling operation. It can be operated with low temperature water (18-40 °C), which means the building structures are not damaged. Due to the low water temperature, it can be assembled with boilers, heating-cooling equipment of good efficiency such as condensation boilers, solar collectors or heat-pumps. 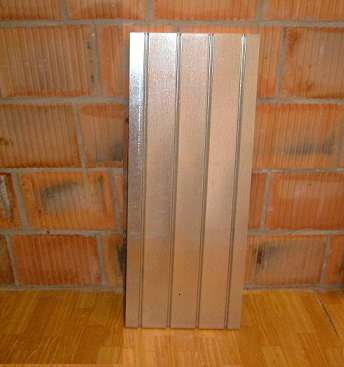 The wall heating panel can be applied for heating either new or renovated buildings as a low-temperature heating system. This advantage can of course be used for the elegant execution of flats, houses, offices, hotels, shops, galleries, swimming-pools, churches and exclusive solutions of interior designs. Lower temperature of living space has a positive affect on the autonomic nervous system, people generally feel more refreshed and brain capacities increase. From a medical aspect it is remarkable that the dust loading of rooms decrease due the absence of air ventilation in the use of wall heating. The costs of a combined heating/cooling system are higher than those of the heating system alone, but lower than the costs of traditional heating and air conditioning together. In addition, we can offer distributors-collectors for the system that can realise the possibilities of accurate and controllable hydraulic setting of heating cycles and mechanical or automatic independent control of the temperature of rooms. The wall heating’s very fast control makes it more valuable. The basis of this is to circulate much less hot water in the pipe system of small internal diameter than in the case of traditional heating systems (e.g. 70 % of flat radiators) so the heating up period is extremely short. 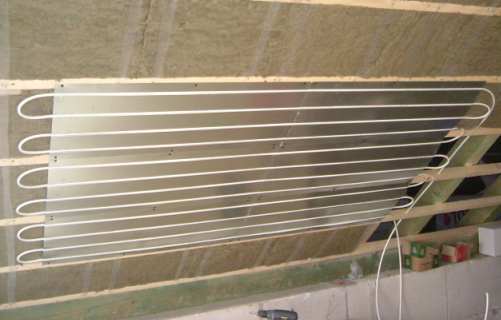 The radiating heat can soon be sensed from the heating pipes covered by thin plasterboard. Another advantage of this system is to fix the wall structure by dry technology and there is no plastering. The structure of the panel is made up of the heat mirror with notch. Multilayer PE-plastic pipes of the diameter of 10 or 12 mm protected against oxygen diffusion are laid into the notches of the heat mirror. The pipes are connected to the boiler or other heating-cooling equipment via distributors. The sizes of panels should be determined according to the plans and heat need, and should be assembled onto the inner side of the outer wall of the room. The panel is mainly recommended to be used in loft construction and light-structured buildings.